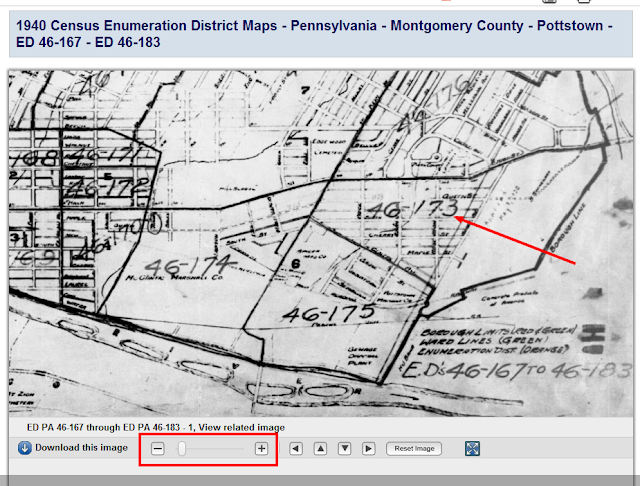 This is an update to my previous post “Tuesday’s Tip – Finding an Enumeration District in the 1940 Census” [link]. 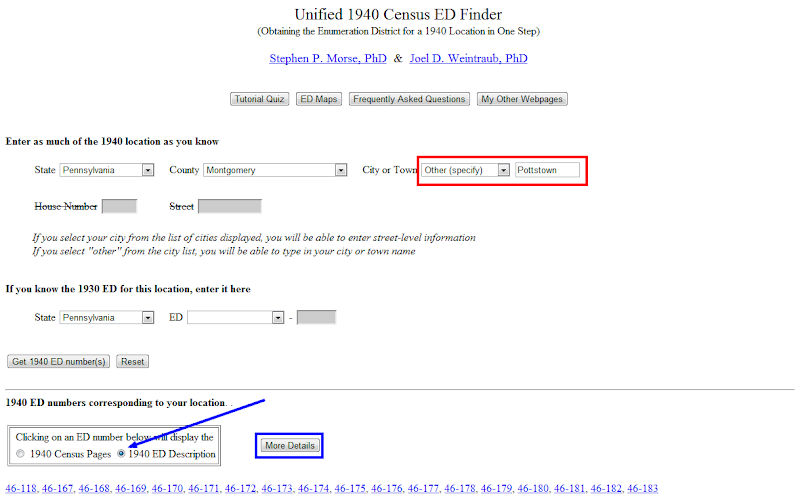 In response to that post, I received an email from Ken McCrea who has added a utility to his GermanNames website to aid researchers in finding the ED maps for various southeastern Pennsylvania counties and their population centers (cities/town/townships). Go to his website [link] and at the very top you can click go to “Guides to the 1940 Census for Southeastern Pennsylvania.” From there it is pretty self-explanatory. He is providing direct links to the maps at the NARA Online Public Access site, eliminating the need to formulate a search query. It makes finding the maps a little more straight-forward. In just 34 days (April 2) the 1940 census will be released. I have already signed up with FamilySearch.org to be an indexer. If you want to help too, you can get more information at the 1940 Census site: [link]. But what if you don’t want to wait for volunteers to build the name index? With a little effort and persistence there is apparently a way you may be able to find some of your relatives sooner. According to the National Archives site [link], NARA will be releasing the digital images indexed to the enumeration district level. I wanted to check into this to see how feasible it would be to locate some of my relatives using the this method. Both my maternal and paternal grandparents lived in Pottstown, Montgomery County, Pennsylvania in 1940 and I have the exact street addresses. I wanted to see how easy (or hard) it is to find the enumeration district(s). 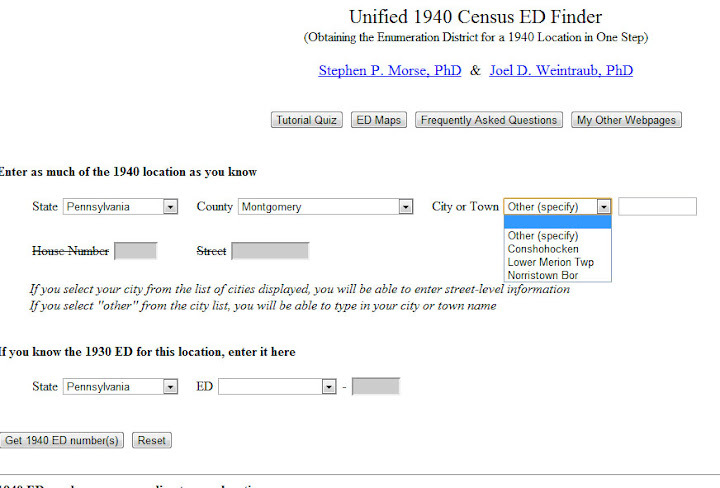 I started with the Steve Morse Unified 1940 Census ED Finder page [link]. I entered the state and county, but as it turns out, Pottstown was not one of the options on the city/town drop-down list. I had to chose other and enter Pottstown in the adjacent box. Clicking on the “Get 1940 ED numbers” box resulted in the screen below. The red box shows where I had to choose “Other” from the drop down box and then enter the town name. If the city I wanted had been available on the drop down menu, I could have entered the House Number and Street and pin pointed the ED. As it turns out, I got a list of all the ED’s in Pottstown. In reading through the ED descriptions, the boundaries are described in clock-wise rotation. I drew the red box around ED 173, which is the one containing both my paternal and maternal grandparents’ homes. You can get more information (such as the number of residences included in that ED) by clicking on the view button on the right. The reason I was able to hone in on ED 173 is because I am familiar with the street layout in this area of Pottstown. It would, however, be easier to visualize the EDs if they were drawn on a map. So finding the map was my next step. By zooming in using the controls at the bottom of the map, it’s easy to confirm that ED 173 is indeed the one containing the addresses that I am interested in. So now, come April 2nd, I have the option of either waiting for the name index or browsing through the images of ED 173. Off and on for about the last five or six years I have been unsuccessfully searching for my husband’s great-grandparents, Andrew and Anna Stibrik and their family, in the 1920 census. They should have been in Pittsburgh, Pennsylvania — but all my searches were drawing a blank. I almost had myself convinced that when they saw the census taker coming, they locked the doors and hid!! A week or so ago, I finally found them! I thought I would relate the story here as the techniques used may help someone else in their searching. I started with the Ancestry’s Advanced Search. (I always use advanced search as opposed to regular search.) Since Stibrik is not a real common surname, I did what I typically do, which is to search on just the surname along with an approximate year of birth. But I had tried that before and knew it wasn’t going to work. I had also tried all kinds of variations of Stibrik — like Stibrick, Stibryk, etc. I had tried to think of ways it could be misspelled or misinterpreted by the indexers (due to sloppy or otherwise illegible handwriting). So I had tried Stebrek, Strebreck, Stibrink, etc. I also usually try to think of alternate phonetic spellings based on how a person might pronounce it with an accent; but to be honest, in the case of Stibrik I really wasn’t sure how that could be mispronounced. After having no luck with the surname-based searches, I figured the last name was either very badly mangled or just plain wrong. (i.e. Perhaps the Stibriks were living with another family and were erroneously enumerated under that family’s surname.) So as a next step I tried searching on just the first names. Andrew, Andr’w, Andy, etc. with wife Anna or Annie. (I was able to add the wife as a family member and have it incorporated into the search because I was targeting a census after 1880 and thus family relationships were recorded.) Theoretically this should have worked, but the problem was the overwhelming number of “wrong” hits that Ancestry was presenting before the “correct” hit. Why were the “wrong” hits appearing first? Well, probably a couple of reasons. If I used “Andrew” as the first name, all “Andrews” appear before those enumerated with “Andrw” or “Andy” or “A.” Adding a “lived in constraint” will give preference to those in the correct location, but will still list an “Andrew” in another state before an “Andy” in the targeted “lived in” location. Add to this that the husband could be enumerated as “Andy” and the wife as “Annie” or maybe they were “Andrw” and “A.” Bottom line, I just wasn’t hitting the correct combination. And this was compounded by the fact that both Andrew and Anna are relatively common names. So what did I do? Well, first of all, I loaded up on family members. In addition to Andrew and Anna, I knew that 5 of their 6 children were born before 1920, so I added in their names in the “family member” section. Then I clicked on “add life events” and put in the location of “Pittsburgh, Allegheny, Pennsylvania” as chosen from the drop down list. Then (and I think this was key), underneath the box containing “Pittsburgh”, I clicked on “use default settings.” A pop up menu came up and I clicked on the “restrict to this place exactly.” I also added in an approximate birth year for Andrew, but left the place blank because he was born in Austria/Hungary and I wasn’t sure if the birth place would be recorded as Austria, Hungary, or Czechoslovakia. Some other tips – I often have better luck searching for one of the children rather than a parent (especially in early censuses (1850-1870) where the family relationship are not recorded. I think this is because the adults have a greater tendency to fudge on their age, making them easier to miss when looking for a George age 32 and he decides he’ll only be 28 when the census taker asks! I also tend to search on a family member with a less common (but easily spelled) first name. In other words, it’s often easier to find the son Horatio than the father John. Also keep in mind nicknames and abbreviations (like Jno. for John or Saml for Samuel) and don’t forget to try also searching with them. Well, I hope this helps. I only wish I had tried the exact place match sooner!! Why can’t I find my ancestor in the census? One of my research strategies (and I think this one probably applies to most family researchers) is that I like to try to find an individual in all the available censuses that span that individual’s life – particularly the censuses from 1850 on in which all the household members were identified by name. So it always bothers me when an individual or family “goes missing.” Now I do realize that on occasion an individual or family actually was missed by the census taker; but more often than not, the family (or individual) was enumerated but the name was misspelled or misinterpreted or a birth date or age is so far off it that it appears to be a different individual. So I thought that I would list some of the reasons that these elusive ancestors cannot be found with a follow-up post on strategies that can be used to find them. Now there are a few different online sites available which have searchable census records, and we’ll talk about them more in the follow-on post. But regardless of which online site you use, the census images are only searchable because they have been indexed – and the indexes have been built by humans. The quality and accuracy of the index is dependent on the ability of the people who build it to 1) read/interpret the census images and 2) type that information correctly into the index. If the index does not accurately represent what is on the image, there are transcription errors. Most transcription errors occur because the person/people who create the index do not interpret what is on the image correctly. This could be because the census image is damaged or faded, the quality of penmanship of the person who wrote the census may be poor or the indexer may not be familiar with old-style cursive script. Also, the indexers are human and even if they read the data correctly, they may type it wrong! Most of the major companies that sponsor the building of the indexes have checks in place that are designed to catch transcription errors, but some always seem to sneak through! In other words, the person being researched is correctly represented on the original census image, but the data in the index is wrong. And since it is the index that is being searched, a match is not found. The other main reason that families or individuals cannot be found is because they are incorrectly represented on the census form itself. One example of why incorrect information may be on the original image is that the further back we go, fewer people could read and write English. And often their spoken English was heavily accented. So the census taker would write what he heard and the individual was not able to correct him. Another problem is that the person supplying the information to the census taker may have given him bad information — either intentionally or unintentionally. Sometimes information was supplied by neighbors or children or extended family members and things like ages, dates and places of birth were “guessed.” In fact, ages are often inaccurate either because they were estimated or intentionally “fudged.” Even last names may have been altered. I have seen quite a few times when the youngest child was born considerably more than nine months after the death of the mother’s deceased husband, yet still carries his name. Often step-children from a mother’s previous marriage were incorrectly enumerated with the name of the current husband. I even have a case where a young girl was living with her older, married sister and was listed with the last name of the sister and her husband. Another “bad” data problem I’ve run into more than once is that since divorce and separation used to carry quite a stigma, often-times people told the census taker they were single or widowed rather than divorced. This has tripped me up more than a few times because after seeing that the man or woman was widowed, I would not bother to even look for the spouse in another household. It also tends to really throw you off when you’re looking for an obituary or death record in the wrong decade! So the bottom line is that your ancestor may be “hiding” due to a transcription error, bad or inaccurate data on the census form itself or a combination of the two!! Now that we’ve discussed various reasons why we can’t find someone in the census, my next post will contain some strategies for finding them! UPDATE: If you are interested in some of the strategies I used to successfully find some elusive relatives in the 1920 census, check out my success story here.